The United States Postal Service (USPS) is the second largest employer in the United States, after Walmart. It has almost 600,000 employees around the United States, performing a number of different jobs. It pays good wages and has an attractive selection of employee benefits. Let’s take a look at some USPS careers and what it takes to embark on one of them. To most people, the mail carrier is the most visible USPS employee. He or she is responsible for the final delivery of mail to the recipient’s address. In urban areas carriers normally walk the bulk of the route. In less densely populated areas they typically drive. This is an entry level job with no requirements beyond the standard ones for all employees. The person that most people deal with at a Post Office is a mail clerk. The clerk is primarily a sales person, selling services and products such as stamps, envelopes, and packing material. They also serve as first line customer service, answering questions and resolving problems when they can. 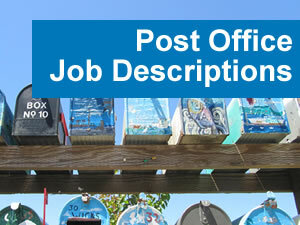 The post office has a number of sales positions that can be career paths from the mail clerk position. Mail handlers and processors shepherd the mail through all of the intermediate steps from collection up until it is turned over to the carrier for final delivery. Some of these are entry level jobs with career paths leading into more technical positions or into management. There is a wide range of more senior engineering, sales, and management jobs available at some locations. Engineers might be responsible for working with the vendors that provide mail sorting equipment. Senior sales people work on customized business agreements with very large mailers. You can find and apply for many USPS jobs online. The Postal Service has an extensive educational program for its employees. The National Center for Employee Development provides training for a broad range of jobs. There are also several management training programs that address the needs of managers in different career stages and in different Post Office departments. There are a broad range of benefits available to USPS employees. They are eligible for the federal retirement program and the Thrift Savings Program, which is similar to the 401Ks offered by many private employers. They may participate in the Federal Employees Health Benefits Program. They have Life Insurance provided, with the option of paying for more themselves. They can accrue up to 26 days per year vacation time, and 13 days of sick leave per year. The major issue facing those who would seek employment with the Postal Service is the declining volume of paper mail in the United States. This is primarily due to the rise of email and the world wide web. These have significantly replaced paper mail as ways to make payments and do other types of transactions. This has caused reductions in the size of the Postal Service staff. Nevertheless, there will always be hiring going on for some jobs, and attrition will cover a big portion of the reductions. Those who are interested in USPS careers should be cautious about this, but it should not stop them from pursuing their interests. The majority of positions in the US Postal Service deail with handling/sorting mail and delivering mail. The job descriptions for these positions are detailed below. Description: Delivers and collects mail on foot or by vehicle providing customer service in a prescribed area, outdoors in all types of weather. Carriers may be required to carry mailbags on their shoulders. A mailbag full of mail can weigh up to 35 pounds. Carriers have to load and unload trays and containers of mail and parcels weighing up to 70 pounds. Carrier duties require prolonged standing, walking, and reaching. City carrier applicants must have a current valid state driver’s license, a safe driving record, and at least two years of documented driving experience. After the mail has been processed and sorted, Postal Service mail carriers deliver mail, to residences and businesses in cities, towns, and rural areas. Carriers are classified as either city or rural, depending on their type of route, but both types share similar duties. In the early morning, mail carriers arrange their mail in delivery sequence at the Post Office. The mail carriers then travel established routes, delivering and collecting mail by either foot, vehicle or a combination of both. Mail carriers also collect money for postage-due and COD fees and obtain signed receipts for registered mail. At the end of their routes, mail carriers return to the post office and turn in their collected mail, receipts, and money collected during the day. Rural carriers perform similar duties to city carriers, but also provide a wider range of postal services such as selling stamps and registering parcels and letters. Both city and rural carriers provide a high level of customer service including answering customers’ questions about postal regulations and services and providing change-of-address cards and other postal forms when requested. Description: Postal Service mail processors prepare mail for distribution at post offices and at mail processing centers. Mail processing clerks may also be referred to as mail handlers, distribution clerks, or mail processors. They operate and monitor automated mail processing equipment and manually sort mail. They also load and unload postal trucks and move mail with forklifts, small electric tractors, or hand-pushed carts. Postal Exam: Mail Processing Clerks must take and pass the 473 Postal Exam. Description: The Postal Services employs many associates who provide sales, customer service and distribution services. These associates provide direct sales and customer support services in a retail environment and perform mail distribution. Postal Service clerks sell stamps, money orders, postal stationery, and mailing envelopes and boxes in post offices. Postal clerks also weigh packages to determine postage and check that packages are in appropriate condition for mailing. These clerks register, certify, and insure mail and answer questions about postage rates, post office boxes, and mailing restrictions. Postal Exam: Postal Clerks must take and pass the 473 Postal Exam.